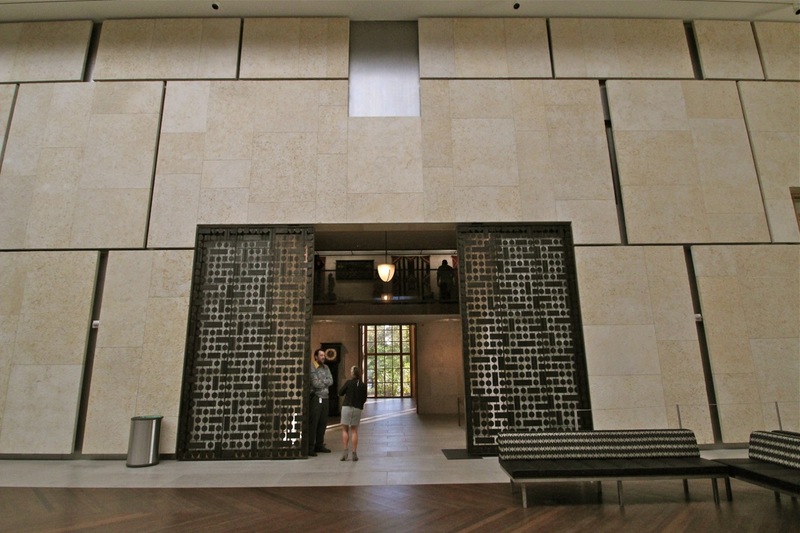 Finally the big day arrived: our visit to the Barnes Foundation. It was the opening of this museum that had started Dan's trip planning. Fortunately, his cold was better, and he felt up for the experience. The museum was only a block from our motel, so we were ready and waiting when the doors opened at 10 o'clock. The big question was how could the architects, Billie Tsien and Todd Williams (a married couple) "replicate the original museum" within a modern, minimalist building. The answer is ingenious. The galleries are exactly the same size and shape as those in the original building, but the floor plan is exploded to place other types of spaces between them—a garden or a reading room. One advantage is that this gives viewers space to circulate; the other is that it gives them a visual rest from galleries that are packed floor to ceiling with art and crafts from many eras and regions. In fact, it was marvelous how well they re-created the old galleries, which we recalled from our visit to the original museum in Merion, a nearby community. The materials and colors are the same; the lighting has a similar tone but subtly brightened. Most importantly, all the objects are placed exactly the same, as specified in the will of the museum's founder, Dr. Albert C. Barnes. Barnes was a medical doctor who discovered and marketed a highly effective drug for the prevention of infant blindness in the early 1900s. As his fortune grew, so did his interest in art. 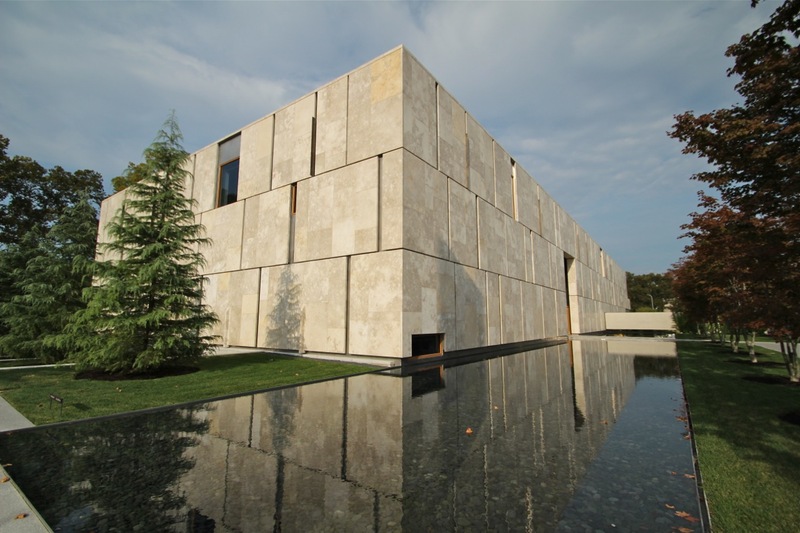 He was widely read and began to develop a lot of theories about art and education, and he created the Barnes Foundation to propagate them. One of his theories was that craft should be honored alongside art. He was particularly fond of certain types of metal-craft and wooden chests, but he also like African masks and American folk crafts, among other things. Another of his theories was that art and craft could be displayed together in a way that enhanced their aesthetic commonalities. Thus, he was obsessive about the way he arranged his ever-growing collections. I imagine him sitting up late at night with a glass of whiskey and a cigar arranging and re-arranging his beautiful stuff, then making up arcane explanations for his "wall ensembles." His favorite thing was to have a large antique chest on the floor, above it a row of fairly large paintings, above them smaller paintings, above and around all of them, decorative metal-work. Much attention was given to symmetry of sizes and subjects as well as to shapes. Some of his explanations are reasonable; some are comical, late-night ideas. Since no photography is allowed in the galleries, I'm going to crib a few shots from the web to give you an idea what it is like. With masterpieces by Cézanne and Seurat, the wall below was one of the most intense. In this case the largest painting is sensibly placed above the medium-sized painting, which is flanked by pairs of smaller paintings, and the whole is given flourish by a symmetrical arrangement of metal decorations. 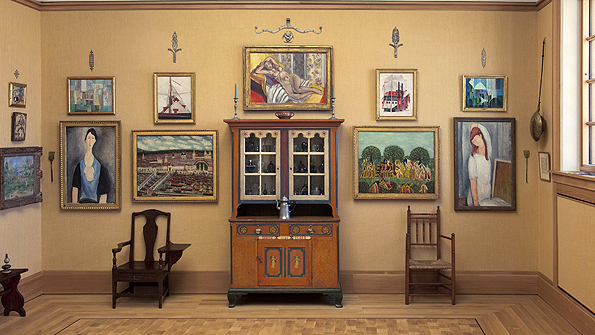 On the wall shown below, a hand-decorated chest is the center-piece, flanked by two antique chairs of different eras. 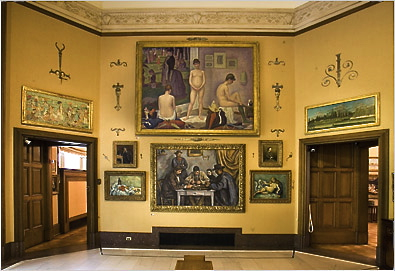 Above them is a row of medium-size paintings, and the small paintings are in the highest rank. Barnes had an annoying habit of placing little gems well above eye level, more enamored of his arrangement than of showing off the paintings. As for the painting collection, Barnes was obsessed with Renoir; 181 nudes, portraits, landscapes and genre scenes by this artist are exhibited. Some are breath-taking and unique, others are fuzzy and over-ripe, like fruit that's past it's prime. Humorously, he frequently paired a romantic Renoir with a cerebral Cézanne—of the same size, of course. His 69 works by Cézanne provide a refreshing balance to those by Renoir. Another pair who interested him is Picasso and Matisse. The collection includes 46 works by Picasso, including one very large depiction of some peasants with a horse that holds pride of place in one of the galleries. Among the 59 paintings by Matisse is a marvelous mural. You've heard of the "Music of the Spheres"? This could be called the "Dance of Eternity." Some of his favorites are easy to like; some are challenging. For instance, there are 7 beauties by van Gogh, and 21 messy, tortured paintings by Chaim Soutine. It is amazing that he could collect 18 primitive paintings by Henri Rousseau, whose output was rather small. He also scored 16 paintings by Modigliani. Some lesser artists who interested him were Utrillo, Prendergast, and the American artist William Glackens, who was his friend from high school days. Glackens advised Barnes on his collection, and Barnes purchased his friend's best paintings, arranging them in a line together in one of his ensembles. Another of Barnes theories was that the viewer should enjoy the art for itself, without knowing the name of the artist, so no wall labels are provided; anyway, they would be impossible to read at some heights, and they would wreck the harmony of the ensemble. The galleries have stands with "wall maps" that identify each work. The viewer stands around trying to figure out what is what. We had lunch at The Garden Restaurant in the museum. Seating was on tall stools at long rows of tables, but the food was gourmet standard. After lunch, we couldn't return to the galleries right away because there is a limit on the number of attendees; we waited in the Great Hall for awhile. About an hour after we got back in, I started to feel queasy. Since the motel was nearby, I decided to take a break. After telling Dan, I walked quickly back. After an Alka-Seltzer and a brief nap, I was back on my feet. I swung by Starbucks, which was conveniently located on the corner opposite the Barnes, before I returned to viewing. I still had time to see the rest of collection. I ran into Dan, but we continued to tour separately, meeting up in the gift shop when the museum closed. I stayed in for the evening. Dan walked back to the Belgian Café for a bowl of seafood chowder and two on-tap beers, then he packed it in as well. He had enjoyed the day, but his cold was still sapping his energy.